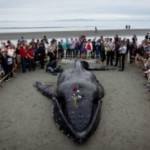 A make-shift funeral was held for a young humpback whale which died after being washed ashore in Canada. 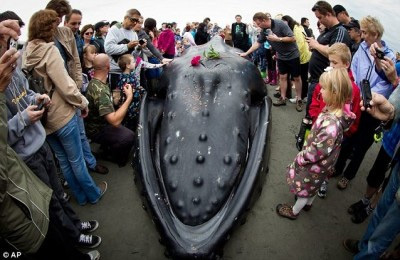 People gathered on White Rock beach in British Columbia to pay their respects to the magnificent creature, which came into difficulty after getting caught up in fishing net. It became grounded on the beach and was first spotted on the sandy tidal flats early on Tuesday. Well-wishers lay roses and other flowers on top of the unfortunate animal after authorities removed the net that had plagued it for several hours before it died. That net will be used to trace its owner, although officials say it is believed to have been a case of accidental entanglement. The whale endured a long struggle, without food, prior to its death, Department of Fisheries and Oceans marine mammal co-ordinator Paul Cottrell told the Canadian Press. Marine experts will try to identify the whale so that they can track where it has been in the past. ´That´s kind of a fingerprint we have to see where the animal is from.´ Cottrell told the news agency. They hope to learn information about how the whale became entangled so that they can identify future threats to other whales off the British Columbia coast. Humpbacks are listed as threatened under Canada´s Species at Risk Act.